Posted by Rhett Mcdaniel on Wednesday, May 18, 2016 in News. We need to have coordinated lectures throughout our curriculum so that students get key concepts early and then build on that solid foundation. We need to avoid undesired redundancy. We need to keep students engaged throughout the three 8-hour days they spend with us in block. We need to quit powerpointing students to death. In 2014 the Psychiatric Mental Health Nurse Practitioner Program faculty team began a conversation with CFT Assistant Director Cynthia Brame that lead to a year-long curriculum revision. It began with a retreat in which the faculty reviewed the curriculum, looking for areas of unintentional redundancy, important gaps, and opportunities to incorporate more effective teaching strategies. They then formulated a plan to revise the curriculum over the course of the summer. After the retreat, faculty dug into review of individual courses, producing course maps like this one (attached course map for 350) that facilitated discussions across and within courses. The most substantive changes were planned for two clinical courses, N356 and N358, that serve as key learning experiences for students in the program. We learned what was redundant and what was missing. 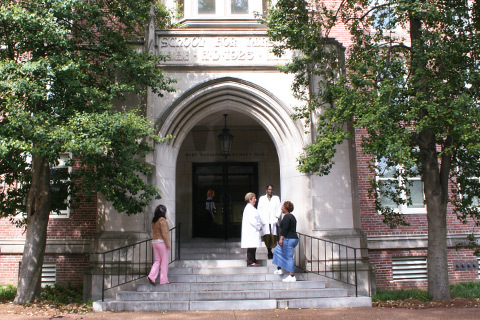 We were able to better align some learning activities with the students’ coursework and preparation, such as including more emphasis on psychosocial interventions in fall clinical courses and eliminating the requirement for a pharmacological intervention that the students weren’t yet ready to give. This resulted in students producing more integrated treatment plans and higher quality pharmacological interventions when they were prepared to include them. We incorporated formative assessments before class that increased the quality of in-class interactions. We incorporated more opportunities for students to learn from each other, such as when they work together to create “toolkits” for use with student-generated case studies and when they work together to articulate practice philosophies. At this reflection meeting, the faculty also realized that they had developed some instructional approaches that could benefit Nursing faculty at other institutions. 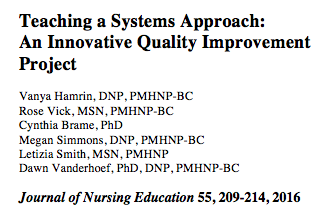 One in particular was an assignment that asked Master’s level nursing students to develop a quality improvement (QI) project for their clinical site, a project that helps students develop leadership and systems-level thinking skills required for advanced practice nurses. 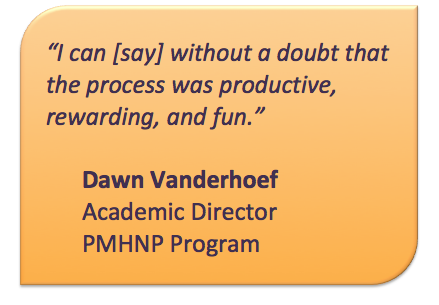 The team of PMNHP faculty who had been most involved in developing the QI assignment—Vanya Hamrin, Rose Vick, Megan Simmons, Letizia Smith, and Dawn Vanderhoef—decided to formally evaluate the effectiveness of the approach and submit it for publication. Led by Vanya Hamrin and collaborating with CFT Assistant Director Cynthia Brame, the team described the need for the project, the strategy for developing the assignment, the theoretical approach that guided improvements, and the outcomes, which indicated that the project helped students develop the targeted skills, publishing the work in the Journal of Nursing Education in April. This highly collaborative project highlights how curriculum revision can be an effective means not only to develop a more cohesive experience for students, but also to promote the scholarship of teaching and learning. The participating faculty members found the process to be productive and rewarding, and they plan to pursue similar projects in the future. A guide to the scholarship of teaching and learning is available on the CFT’s webpage. 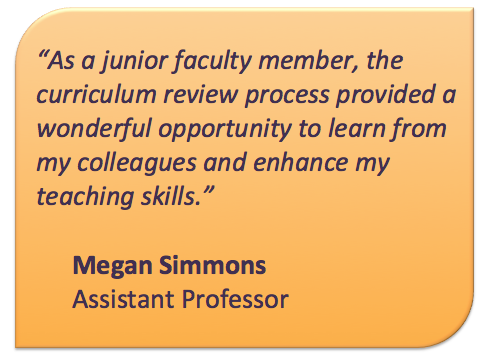 The CFT is available to help faculty consider SoTL projects or to develop a curriculum review process that is effective for a particular department or program. In addition, the CFT works directly with departments in other ways as well. For other possibilities, see our “Services for Departments, Programs, and Schools” page. If you’d like us to help your department with a similar project, contact us at 322-7290.